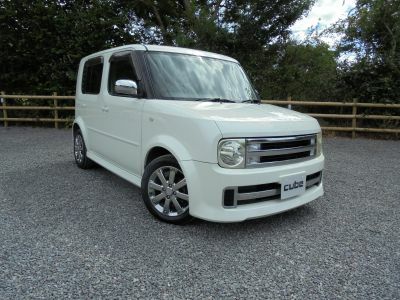 NISSAN CUBE 1.5 RIDER, 5 Doors, Automatic, Box Vehicle - 5 Seats Including Driver, Petrol, 2006 55 Reg, 73,000 miles, WhiteAn Immaculate Example Of Facelift Model Nissan Cube Rider By Autech, Finished in Pearl White with Silver Interior Trim, Covered 73,000 Miles From New with BIMTA / AA Certificate Of Mileage Authenticity, Direct Fresh Import. The Rider Cube is Regarded As Being The Most Exclusive Of Cube Models - Leaving The Nissan Production Line As A Standard Car Before Unique Exterior and Interior Styling Options Are Fitted By Nissan Special Vehicle Division - Autech. This Paticular Example Also Benefits from 15" Rider Alloy Wheels, RDS Stereo with 6.2" Digital Touch Screen, DVD, UK / European SAT NAV, Bluetooth, Electric Folding Mirrors, Multiple SRS Airbags, Electric Windows Front and Rear and Much More. This Vehicle Is Sold Inclusive Of Our Full UK Conversion Package which Includes Homologation, Pre Delivery Inspection, Pre Delivery Service, Owners Manual in English and Comprehensive Parts and Labour Warranty. Part Exchange Welcome, Finance Available Subject to Status.